When we arrived in Metro Manila two years ago, I vowed to find ways to live a good life without wasting precious time (better spent with my family) sitting in traffic and doing mind-numbing, meaningless things on my phone. I realized the key is to have things delivered to my doorstep. Now Manila is not like Berlin, where online shopping is part of the way of life. I would say that many of the biggest brands don’t even have a proper and updated websites to shop from (i.e. Muji or Travel Value). Online shopping for brands like Violeta (Mango’s Plus size brand) and H&M are only more recent introductions and are still shipped straight from Europe. This led me to think of ways to streamline our home and declutter our lives. One thing that dawned on me is that certain baby products can be used by the entire home, and not just for baby. Below are two examples. At the end of each, I share where I usually order, for convenient and secure online payment and delivery to your doorstep. No more lugging heavy bottles and getting stuck in traffic. More time to do things that bring joy and meaning to my life. Yup. Whether you have a baby or not, this applies to everyone. The brand we use and love is Nature-to-Nurture. It contains baking soda that targets milk film and odor. Because it is fragrance free, it doesn’t leave any nasty chemical fragrance residue. It rinses easily, allowing you to use less water and save time. Because it safely cleans all of baby’s feedingware, washable toys, it is also safe and so effective on our plates, pots & pans – even fruits and veggies! TIP: We always dilute it in our soap dispenser, because it’s so concentrated. Soak dirty dishes and glasses with this solution before washing, and it makes washing so much easier. We started using Tiny Buds Liquid Laundry Wash for our baby, because it’s safe to use without irritating delicate skin since it’s made of Natural Cleaning Agents that are biodegradable and leave no chemical residues. I loved that we only use ONE TABLESPOON for each laundry load (we have a 7.5kg Samsung Washer Dryer) and I notice that it doesn’t fade the blacks and colored batches. I love that we no longer have to clean the detergent drawer of powder residue. Then I asked myself, why doesn’t EVERYONE in our home deserve the same benefits? If it’s good enough to remove baby’s poo and pee, then it’s definitely good enough for the whole family, not just for those who have sensitive skin. Now we only use Tiny Buds Laundry Wash each time. One bottle instead of five. My laundry has been decluttered and simplified immensely. We also love using their talc free baby powder, baby wipes (my local alternative for Water Wipes) and rash cream. In the end, it doesn’t really matter what brands you use, as long as they are fit for your family’s needs. These simple changes were life-changing for our household and I hope it has the same effect on yours. This is not a paid or sponsored post. I just love these products so much that I wanted to share them with you. I hope to share with you more tips on ways to live more while doing less; to improve our quality of life, and live more consciously of each other and the environment; while saving money, and helping more people earn a living through the sharing economy. Are there any other natural, safe baby products that you love to use for the rest of your family or home? Please do share them with us in the comments below. As a busy WAHM (Work at Home Mom) ordering online has been a life saver. We buy in bulk, and they deliver it straight to our door. We don’t need to lug heavy detergent/soap bottles or packs from the supermarket. It’s so convenient. We save supermarket and market trips for things that we really need to examine before buying, like fruits and veggies. Right now below is what we order online in bulk to save on time and money. We get refills for liquid items in bigger volume, to fill the existing containers – it costs less and it’s better for the environment. What other items do you mamas order online? I would love to hear about it and which brands you like, and why, in the comments below. To declutter your space even more, Marie Kondo recommends removing product labels. 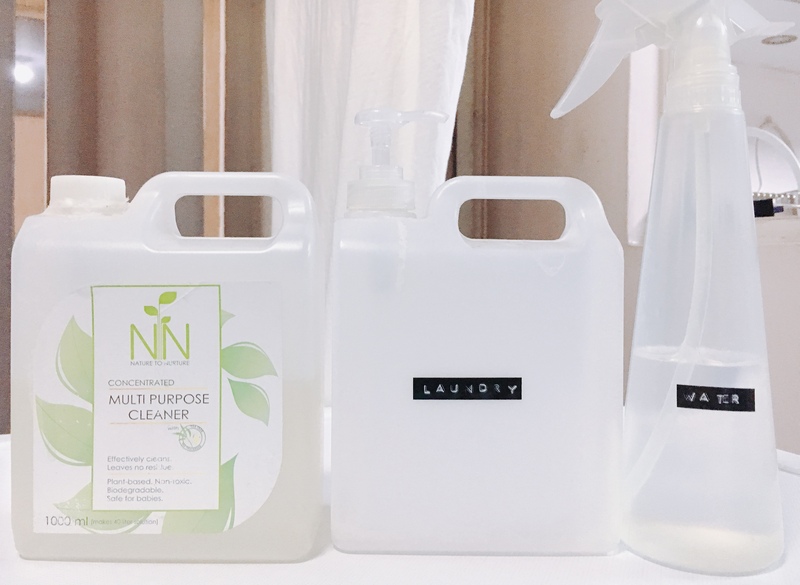 (Think MUJI minimalist style products) It really helps visually declutter your areas. Label instead with Dymo Labeler. The old school one, has better adhesive that can withstand moisture and washing. thanks for sharing Ayessa! planning to do this at home.